The team have a day out at the seaside with a valuation day in Brighton, and Paul Martin goes back in time to the silent movie era in Shoreham-by-Sea. That building is where the very first film was shown outside of London, and the year? Well, "Flog It!" today comes to your screens from Brighton. Brighton has always been the place to come for entertainment. the Duke of York's, was opened here in 1910 and it's still showing films today. where this very healthy-looking queue aren't just standing in line for popcorn! Oh, no! Or waiting to see the latest Hollywood blockbuster. are our very own "Flog It!" stars, experts Catherine Southon and Mark Stacey. Well, let's not hold things up any longer... Action! Welcome to sunny Brighton, although it's not quite so sunny today, is it? -These little ornaments, tell me about these. we had to clear the house out and that was one of the things I thought was quite sweet and I kept them. and I thought, maybe, you know, they could do better. -So you haven't had them out on view or anything like that? and I think they're certainly continental, they're not English made. The type of porcelain they are is generally referred to as bisque. -Bisque is porcelain, but it's unglazed porcelain. and in those days, people made a lot more of their own cakes and they wanted to decorate them. We've got little dancing figures and some animals over there. I mean, I quite like the little bear there that's skating. or Christmas cake decorations, that sort of thing. but there are people out there who collect this sort of thing. You've had them since when? About 25 years, when my aunt died. I think it was late '81 she died. -And they've been stuck in a box since? You've never thought about the value? No, because I didn't think they had a huge amount of value. Well, I think you're right there, Jane. with an estimate of something like £30 to £40 and just see what happens. -we might not get any offers at all, you never know. -But I think there will be interest there. Now, on figures like that, we ask people whether you want to put a reserve on it. then if the highest bid on the day was £10 then they would sell for £10. -Sorry, I didn't ask you. and let's hope at the auction, they prove to be the icing on the cake. and bringing some lovely Whitefriars. Where did you get this from? It was a wedding gift in 1968. I don't know if you know very much about it but it is Whitefriars glass. That's all we did know, yeah. but this piece has sort of moved out of place, so we've got this abstract form here. and he was, in fact, their last designer up until the factory closed, which was in 1980.
which is known as the coffin-shaped vase, which is pretty nasty. Not really a very nice piece to be given for your wedding present, I shouldn't think. Were you given these two pieces together? They've been wrapped up in the cupboard for years, that's why we've brought them along now. Then we moved and then they stayed wrapped. -And they've been wrapped for about 26 years. These pieces are coming back into fashion. Whitefriars is now very collectable and lots of people are buying these. -was very popular, but what we've got here is more of a smoky green. there's two tiny chips on the rim, which will make a difference. -How does £100 to £150 grab you? -You'd be happy to sell it? It seems really sad that they were a wedding present. -You've got one another so you don't need Geoffrey Baxter. Let's put them in the auction at £100 to £150. Harry, these are absolutely incredible. Tell me the story. How did you come by these two glasses? Well, they were given to me just as a present. They said, "You can have these two glasses," and I've got a few more as well. -No, not like that, just ordinary sherry glasses. But they were in it and I was more curious, not the glasses but why there was a hangman inside it. Yeah, exactly, I would be as well. How long ago were you given these? Well, about seven years ago, that's all. Let's start with the weight of that glass. That's incredibly heavy, isn't it? deep-sliced cutting. You see that sliced cut right through, those facets? -and that's a trailing vine of barley and hops. -Oh, now I can see it. predominantly done around the Birmingham area, Stourbridge. an ale or a mead glass, you know, stronger than beer, you wouldn't drink a lot of it. They differ slightly but if you're drinking down and you say, "Bottoms up"
and another figure at the bottom of this glass as well. It sort of beggars belief, really. as sort of one last drink before they hit the gallows? Well, they could have done! and they were captured and finally left to swing and everybody toasted it? -why a thing like that would be put in a glass. I mean, you could have a nice engraving or something, or a picture of a castle but not hanged men. with a value of 200 to 300. That'll pay for my petrol. What did you think they were worth? I thought they were worth about £80, £40 each. I think they're worth an awful lot more than that. Do you definitely want to sell them? with a guideline of £200 to £300 and maybe put the reserve at 150? That'll be fine, yeah, I'd be very pleased with that. to see us here in Brighton and you've brought this charming picture of a spaniel in. and I didn't want to throw it away, I liked it so I saved it. Had it been up on the wall or was it tucked in a wardrobe? -It was in a cupboard. -Really? So she hadn't had it up for a while. -Have you had dogs yourself? I like the picture. It caught my eye and that was it. If we look at the picture, it's very well done, actually. There's a lot of feeling in there. and I think she's captured the essence of that really rather well. -And it's a beautiful drawing and I think it will be very popular. which was actually quite a lot of money back in 1937, wasn't it? Brighton Fine Art Galleries. People like that. When you're selling a picture, people like to see that little added provenance to it. There's a few things that go against it in some ways. would want to take it out of the frame and remount it and put a more modern frame on it. Why are you thinking of selling it now? I heard "Flog It!" was coming to Brighton. I thought, a couple of new golf clubs or something. Well, it's always good to put it towards something else, isn't it? is that you tend to get a lot of private people wanting to buy it. In terms of the artist, there's not a huge amount known about her. and things like that, with novelty animal scenes on it. I would suggest maybe around £200 to £300, with a reserve of 180.
and I hope I'm not proven barking mad by taking the picture. What, has Mark lost his head over the spaniel? It'll soon be time to find out but first, here's a reminder of what we're taking to auction. Jane and Gordon's cake decorations are finally out of the drawer. We can only hope they find some bidders with a sweet tooth. Teresa and Bruce's Whitefriars vases have spent 26 years in a cupboard. Even with the slight damage, I think people will be pleased to see them. with the mysterious hanging men engraved on the bases. And finally, Mick's little pastel of Flash the spaniel. It's so appealing, it's bound to get dog lovers drooling. the home of Worthing Auction Galleries and Scarborough Fine Arts. I've got a good feeling about this one. I think we're going to get some cracking prices. and I'm after Nick's opinion about those glasses. -I love these tumblers, there's great weight to them, beautifully cut, beautifully engraved. The belong to Harry. He was given them as a present. -There's something quite interesting in the bottom. -Yes, I saw that, yes. -possibly maybe a bit more. Over to you, it's your round. they've got the hangman's noose. As we all know, it's for the last drop. It's just a bit a fun, There's no significance to gallows. That would make them more collectable if it did. But dining room furnishings have gone the way of dining rooms. There's just not that great demand for them. I've got a feeling Nick's talking this one down. -Oh, dear, this is not a good start. I suppose I've got to put my neck in the noose and say they possibly won't sell. We'll have a good crowd here and we'll do our best. a little bit of discretion as well. They're here to go. But they have been causing a stir. People have been picking them up and looking at them. That's positive. Happy? -And all the money is going to charity, I believe? Can you tell us what charity? -We're going to support Martlets, our local hospice. -They need lots and lots of money. Let's hope we can raise some money to help you. I think they're rather fabulous. -But how do you value them? I think you've done a pretty good job. Let's find out, shall we? This is it. Lot 290 is the group of 1920s, 1930s cake decorations. Continental lot, there's 18 in there. Dancers and bears, musicians. What are we going to say, £30? -30 for them. 20, then. Thank you. 30, 35, 40, 45, 50, 55, 60. -Lady seated, at £60 if you're all done. 60, I'm selling. £60! That's unbelievable, isn't it? -They really did like them. £60 towards the charity. Good luck and I hope you raise lots of money as well in the future. Is it going to be cheers all round? According to what Nick said, Harry and I might be in a bit of trouble right now. but he thinks they're going to struggle. -We had a chat with him earlier and you know what he said - the lower end if at all. -I'm not really bothered, anyway. I knew that. I said to him £75 a glass, I think is cheap. We've got a fixed reserve of 150. If they don't sell for that, you're better off taking them home. That'll save me buying two more, won't it? But let's not think pessimistically. Look, the room is absolutely jam-packed full of bidders. Let's hope they find them just as interesting as I did because they are unique. You can't buy them anywhere else! why somebody would have a hanging man. It's just a bit tongue in cheek. You finish the glass and there you are, there's the last drop. So it makes sense, doesn't it? Is this the last straw, Harry's thinking, is this the last straw? -It is the last straw, yes. We're going to find out right now because they're going under the hammer. Got a nice pair of tumblers here. Mid-19th century, nicely engraved, good glassware. 100 the pair. 90, 95, 100, 105, 110, 115, 120, 125. -Is that 140? Thank you, 140, 150, 150, 160. Just got away on that one. £150, anyone else coming in? 150, are you sure? 150, I'm selling. -Don't think you can either. and he said, "They're gonna struggle." Fashions have changed, nobody's buying glass. it's so hard to put a value on things. -And nobody's getting hung nowadays. So they won't make any more! Something for all you dog lovers right now. It's a pastel of a cocker spaniel with a valuation of £200 to £300 and it belongs to Mick here. Quality! Are you a dog lover? I am, yeah, I like dogs. I just think this captures the cocker spaniel so beautifully. -It put a smile on my face. It's got that lovely "come and get me" eyes that a spaniel has. The begging, sort of doe eyes, but has it got that "come and get me" price, too? it's got the original exhibition label and price on the back of it. there are some dog lovers like you and I out there, Paul. Why are you selling this, Mick? I've changed the decor a little bit. A picture of Wellington Bowl has replaced the dog. Fair enough, OK. Let's find out what our bidders think, shall we? 100 for it. 80, then. 50 for the cocker spaniel. I think you'll be taking it home. Ah, we're slowly in, it's slowly climbing. -Come on, give this doggy a home. -85, 90, 95, 100, 110, 120. -Come on! Yes, this it good. Obviously, the dog lovers weren't here! I'm the only one and I'm not allowed to buy. -It's going home. There's another day in another saleroom, though. Make sure you look after it and put it back in another sale. If I said Geoffrey Baxter, you know what's coming up next. -that you've put together - wedding present. Bruce and Teresa, and Catherine, you've put £100 to £150 on this. -Little bit of damage, just might hold them back. -Just on the... What's that one called? -That's the one the damage is on. but the main piece is the bricklayer. -We should get it away. -I think it should be top, hopefully. -Have you kept many other wedding presents? This is the last to go! Yes, oh, she's the best one, isn't she? Lot 80, some Whitefriars there. A drunken bricklayer and a coffin vase. Two items, both Whitefriars. Where are we going to start? 75. -85 offered, 90 new bidder, 95, 100, 110 with you? £120, this lady standing. New bid at £130, thank you, madam. £130 in front of me. £140 I'm bid here, another new bidder at £140. -At £140, you all done? -Wonderful, yes, thank you very much. -So, how are you going to treat yourselves? getting married, so we're going to spend it, take the money with us and take it towards a trip to Canada. -The trip of a lifetime. -Well, we have been before. -I love the place, love it! It's brilliant. Well, enjoy it, won't you? -I think we're too old for that! Shoreham beach was described as the British Hollywood! to one of the greatest collections of theatrical talent outside London. lived here in a ramshackle collection of caravans, sheds and old railway carriages. They sort of gravitated here for the summer - it became the place to hang out. It even had a name - Bungalow Town. And to find out why, I've come to talk to Helen Poole from the Marlipins Museum. Helen, so why did they gravitate here? -and from then on, all kinds of people came along. -When did the film-making start? Well, it started about the same time as the First World War ironically. and it was then in the hands of F L Lyndhurst, the grandfather of the famous Nicholas Lyndhurst. there was a bit joiner's shop and there was accommodation for the stars and it was quite a complex. As there was no artificial lighting in those days, all films had to be shot in daylight. were produced here, in Shoreham Studios, over the summer months. output doing what the British film industry does best - making adaptations of classic novels. -age of 81 at the time, got involved, watching the filming. -Pity he didn't take part. -and it was quite a bit of kudos for the local people to have that involvement. -Have any of the films survived? and happily we've got quite a bit of The Mayor Of Casterbridge. What happened to it eventually? How did its demise come about? which was risky to say the least, and hotfooted it out in time to put the fire out. which is sadly a story that's persisted. Well, it looks very different nowadays, doesn't it? and the big buildings went, and the area was cleared in a fortnight. Happily, a recent discovery has shed new light on this important part of the history of British film-making. daughter of Progress Films' managing director and young star of The Mayor Of Casterbridge. so we can watch the film together and chat about her mother. It must be really special for you seeing that. Your mum was so young there - how old was she? and to watch my mum, at the age of 16, playing the part of Elizabeth was a very special moment for me. -And it was very moving and very emotional, it was a little bit of magic really. as you were a young child growing up? Sadly she didn't really, no, she never really told me many stories at all. She never seemed to want to talk about it. but was very disappointed when she told me that sadly they'd all be burnt in a fire. which was put away for over 50 years. Boxed, literally, and then obviously you inherited it. and suddenly I found a great deal more out about the days of the filming in Shoreham. Do you wish you'd asked your mother a bit more about it? her to talk about it, because she never really raised the subject. industry down here, in Shoreham, we'd like to know or get in touch with the Marlipins Museum. -and reliving those memories once again. Well, it's been a real treat coming here today and looking at this beach. Who could have imagined it had such wonderful stories to tell? brought into our valuation day. First up, it's Catherine with something off the wall. Barbara, I love this Black Forest coat hook you've brought along. -A very nice piece. Where did you get it from? -It came with house and contents. In 1971. It's been in the loft ever since, 30 years. So you moved into the house and you saw this? -That was on the wall. -And you didn't like it? -I loved it, but it's out of place. -It doesn't go in your home? -It's actually carved out of walnut and it's beautifully and quite intricately carved. -quite a bit of damage, quite a few of the leaves have been broken off. but you can still see its overall appeal, and I think a collector will just go for the rustic charm of it. -And I think it will appeal to many collectors today. Now, value-wise, do you have any idea what it's worth? I don't have a clue, don't have a clue, truly. -Black Forest is very popular, lots of items do come up for auction and do command quite high prices. let's say £80 to £120. -Perhaps with a £60 reserve? So, if it did make that money, what would you put the money towards? -For that amount I would take my daughter out for several lunches. -How kind you are, what a kind mummy! Let's hope it commands the higher end of that, and then you can take her for a nice gourmet dinner. -I'll see you at the auction, thank you. Thank you very much for coming to visit us in Brighton. You've brought this nice piece of jewellery. -Can you tell us a little bit about it? that much, but I am intrigued by it, cos it hasn't got any marks on it. -because it dates to the early part of the Victorian period. -1840, 1845, something like that. But that's a typical type of setting for that period. It will be gold and probably 14 carat or something like that. -three central garnets, one of which unfortunately is slightly damaged. -And then just a little slight bit of reeding on the shank there, around the rim. And it's quite a decorative piece. -Not a particularly commercial piece for wearing. It's not the sort of jewellery that somebody wants to wear now. -Because it's quite an old-fashioned setting. Having said all that, you've had it for a number of years. -Yes, quite a few, yes. -And why have you decided to sell it now? 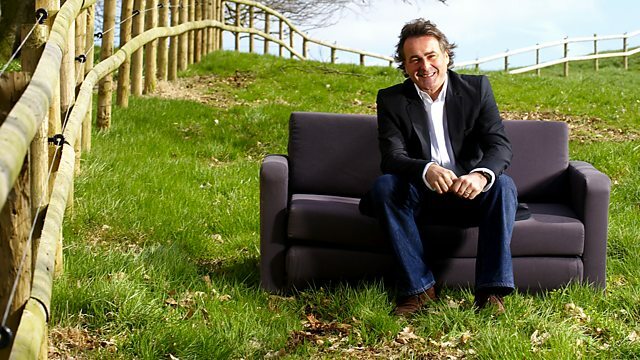 -Flog It were in town, so I though I'd bring it along. It's nice to see a nice honest early piece of jewellery, but unfortunately the value doesn't reflect that. -I mean, there are collectors for it, but I suppose, at auction, that's worth around £100 or so. -Yeah, I thought it might be less than that actually. -Oh, I wish I'd said that now. -maybe around the £90 mark, something like that, to protect it. And hopefully on the day, you know, two or three people will want it and it might sail away a bit. And if you did sell it, what would you put the money towards? Another piece of jewellery? Probably, yes, cos I do like jewellery and rings, but not that one. Betty, thank you very much for coming along to Flog It and bringing along your beautiful Shelley coffee set. -Now, tell me, where did you get this from? -and then it came through to me. -Right, OK, so you inherited it? -It is rather beautiful - is it something that you like and you enjoy? and so I thought I'd bring it along to Flog It. I mean, I must say it does look to be in absolutely perfect condition. it does look like it's ever been used, which is a bit of shame. that it's got the name of Shelley, and it's a lovely porcelain coffee set. What's wonderful about it is that it's got these wonderful pointed handles, they point downwards. of coffee, you don't want it to slip out of your hands. where it did have the hole through, and this was known as the Mode shape. mixture of a very angular, Art Deco trendy shape, and then we've got this very traditional painted pattern. -Now, do you have any idea of how much it would be worth at auction? -I think maybe £100, £150. -at around £200 to £300, how does that sound? I think we should probably put a reserve on of about £180, but I can see it doing £200 plus at auction. -So, if it does make a good price, what would you do with the money? -I haven't decided yet...have to see what it does make at auction first, won't we? -Let's hope it makes the higher end and you can buy yourself something special. Thank you for coming, and fingers crossed. I'm certainly hoping for something special at auction. Let's remind ourselves of what we're taking with us. Will Catherine be proved right? Will the collectors get hung up on the rustic charms of the Black Forest coat hook? but is it too old-fashioned to sparkle in the eyes of today's bidders? but the strange mix of styles might leave the room lukewarm. Back at the auction, there are plenty of paintings on offer, and one in particular has caught my eye. your faces off, but there's something about this woman. but I love the pinks, I love that sort of coral-y colour. It's quite striking. it's got that kind of feel about it, and I think it's well executed. but I can see a value of £100 there and I could see that on my wall. with confidence and, well, she's not exactly beautiful, but I like it! Betty, Shelley always sells well. It's done us proud in the past on Flog It, and I'm pretty sure it's going to do well today, Catherine. £200 to £300 for this coffee set. It's in immaculate condition. You've never used it, have you? No, I don't think it's ever been used at all. it's got the angular Art Deco form - but it's a traditional pattern. If it had a jazzier, more cubic pattern, you'd get a bit more money for it? -Good luck, Betty. I'm pretty sure we're going to sell this and get some money for it. Nice Art Deco 15-piece coffee service. What are we going to say? £100 I'm bid, thank you. £100 offered, any advance at £100? I'll take £105. £110 with you. £110 I've taken. £180. £180, on my right. At £180, anyone else coming in? At £180, I'm bid on the Shelley. All done, you're sure? £180 with you, sir. £180, the hammer's gone down, Betty. -Yes, I am, yes, thank you very much. to make a little bit more - just pinched it, didn't we? What are you going to put the money towards? I don't know, I think I might invest in some Premium Bonds and make it a bit bigger. This is real quality, Sarah. I don't know why you're selling it. -It's a lovely mourning ring, early Victorian, we've got a value of £100 to £150. it's quite old-fashioned - so I've never worn it. So, it's time for it to go. -You've brought your daughter along, haven't you? -Hi. Doesn't she want to wear it? -Got to have bling in Brighton. -Do you have bling? You live in Brighton. I do live in Brighton, but I'm very shy and reserved, as you know. Let's hope we get the top end of the estimate, OK? Good luck. dated 1840 or thereabouts, with garnets and pearls. Pretty little ring. Shall we say...£100 for it? Thank you, £100 for it. £100 it is then on my right. £140, £140. On the right at £150, new place. At £180, you're all out. -We're playing darts now. How about that? Really good. What are you going to do with £180? I'll probably put it towards another ring. Some bling for your daughter. looked very Bloomsbury school, sort of Augustus John-ish? Well, it's just about to come under the hammer. I'm going to have a little bid on this one and probably go up to about £150, £160 or £170. within the catalogue estimate, but you know what auctions are like. You've played the game - let's see how this one goes. -Thank you, a miserable start, but £80 it is. £120. On the chair at... Bidder? At £190 with the distinguished gentleman. Got it! Sold! Sold to me! The ugly woman is sold to me! Oh! I'm so happy. I promised myself £180 and I kind of, well, got it. depending on how much we get for the Black Forest carved coat hook. I love it! -It's got you written all over it, hasn't it? -It has! Yes, it has. Beautifully carved. There's a little bit of damage, but that shouldn't put people off. -Little weekend away - where do you fancy? We'll do our best, it's going under the hammer right now. Nice bit of Black Forest carving there, the walnut coat rack. Always popular, start me at £200. Did you hear that? He said, "Start me £200,"
-and someone went, "Yes, sir!" £300 offered, thank you. At £300. -They don't mind the damage. £300, almost straight in and straight out. -Barbara, the Isle of Wight, here you come. Your daughter, Deborah. Deborah, you're going to the Isle of Wight! Brilliant result, thank you very much. Lovely item. -Well done. Thank you, Barbara. time we've had here by the seaside, and, do you know what, I can't wait to come back to the south coast. All credit to our experts, they've worked incredibly hard and so too have our two auctioneers. And of course, I've got my oil painting. Some say she's ugly, but, do you know what, I love her! Can't wait to take her home, so until the next time, it's cheerio. was made, visit the website at bbc.co.uk/lifestyle. Paul Martin and the Flog It! team have a day out at the seaside with a valuation day in Brighton. Experts Catherine Southern and Mark Stacey make some great finds with antiques brought in by the public and Paul goes back in time to the silent movie era in Shoreham-by-Sea.